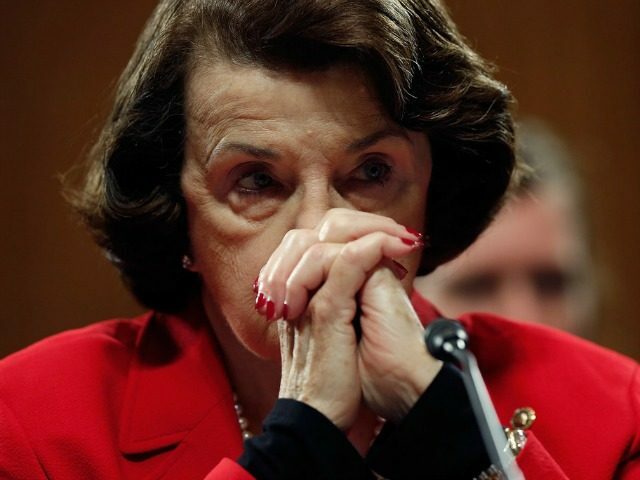 Sen. Dianne Feinstein (D-CA), the Senate’s oldest currently sitting senator, blamed a “bad cold” that might have impaired her mental faculties, leading to her releasing Fusion GPS co-founder Glenn Simpson’s testimony without giving Senate Judiciary Chairman Chuck Grassley (R-IA) advanced notice. On Thursday Feinstein told reporters that she denied claims that she said she was “pressured” to release the Simpson transcript. “I made no statement to that effect,” Feinstein said. “It appears in one place, and I saw it, and I’m just telling you, you asked me the question, and the question is, it’s not correct,” Feinstein added. Just asked Feinstein about her comment yesterday about being "pressured" to release the Simpson transcript. "I made no statement to that effect," she said. "I don't believe there are. I don't believe I said that." Sen. Feinstein, 84, already plans to run for a fifth full term that would last until she is 91. California States Senate President Kevin de Leon (D-Los Angeles) will run against Sen. Dianne Feinstein in 2018 in the Senate midterm elections. Feinstein published the Fusion GPS co-founder’s testimony to the Senate Judiciary Committee shortly after a bipartisan meeting at the White House to discuss a potential solution for the beneficiaries of the Obama administration’s Deferred Action for Childhood Arrivals (DACA)program, which President Trump has ended, effective March 6. The California Democrat rejected a tweet by President Trump earlier Thursday suggesting that she broke the law by releasing Simpson’s testimony. “I didn’t do anything illegal. … That transcript has become so abused that time has come for people to take a look at it,” Feinstein added. Sen. Feinstein released Simpson’s testimony on Tuesday despite Grassley’s opposition. Simpson had requested that the testimony be released in a New York Times op-ed.